Gardeners have been growing hop as an ornamental vine for many years. Recently, I have seen more hop grown in backyards for home brewing. This is especially popular among younger male gardeners aged 18-34. Hop is a herbaceous perennial vine that grows well in central Illinois. Two types of hop grow here. Our native American hop (Humulus lupulus) comes in various cultivars used to produce different flavors in beer and tea. Do not grow the Japanese hop (Humulus japonicas) because it can be quite invasive. Both have palmate leaves, but the American hop leaf has three lobes, while the Japanese hop has 5-7 lobes. Both types are vigorous vines requiring good support. American hop vines can grow 20 to 30 feet long in one summer and then die back to the ground each fall. I have American hop growing on a picket fence in my herb garden. 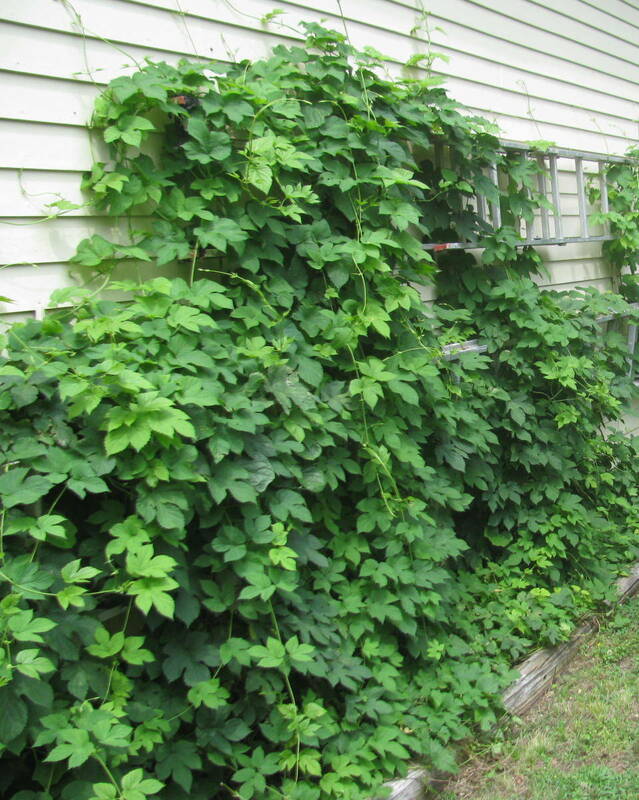 Because hop grows so quickly, I continually guide the vines to grow on the fence and not the surrounding plants. Hop plants produce both male and female flowers. The female cones (also called hops) are used to make beer and tea. The hops are mature when you can see the yellow substance (lupulin glands) within the cone petal. They will also be sticky and have a hop fragrance when crushed. Harvest cones when they feel dry and papery. Dry cones can be stored in air-tight containers or in the freezer. One hops plant will yield about one to two pounds of dried cones in early- to mid-fall. Brewing craft beers at home is a growing trend. The basic ingredients of beer are water, a starch source such as wheat or barley, a brewer's yeast, and a flavoring such as hops. I have become a big fan of "hoppy" beer, especially those flavored with citrusy hops. In addition to beer, the female hop cone is also used to make tea. I use my hops as an ingredient in many tea blends. Nugget and Cascade are popular hop varieties with home brewers. Nugget is considered a bitter hop that stores well, though it is late to mature. Cascade is regarded as an aroma type that matures early with a floral and spicy aroma. As I mentioned, hop is also grown as an ornamental vine. A favorite variety for this use is 'Aureus.' It has maple-like leaves that are a luminous, clear shade of yellow. If you decide to grow hop, be careful because it can scratch you! The leaf and leaf petioles have sharp prickles that catch clothing and scrape the skin. I learned the hard way to wear a long sleeved shirt and gloves when pruning and handling this plant. Obviously, you do not have to be an 18-34-year-old male to grow hops. Whether you grow it as an ornamental vine or to brew beverages, hop is a great addition to many gardens.